Few filmmakers have been more influential than Jean-Luc Godard. Godard directed such French New Wave classics as Breathless, Weekend and Band of Outsiders, and pioneered the jump cut, a story-telling technique that challenged Hollywood narrative conventions and was adopted by many mainstream filmmakers. The 79 year-old director, a New Wave intellectual and frequent enfant terrible, has been known to provoke as well as pose. He recently came to the aid of known intellectual property pirate James Climent, a photographer who faces a 20,000 euro fine for violating musical copyrights. Climent now wants to take his case to the Court of Human Rights in Strasbourg, and Godard, has decided to help him with a little money and a lot of publicity. Godard, who early in his career worked for Twentieth Century Fox as a publicist in Paris, still delights in pushing the hot buttons. When it comes to IP on the Internet audiences prefer to believe Hollywood-inspired myth that pirates like Climent are folk heroes, and those who seek to protect innovators and their works are merely dull defenders of the state. In a far-ranging interview in the French cultural magazine, Inrockuptibles, Godard said “There is no such thing as intellectual property… Copyright really isn’t feasible. An author has no rights. I have no rights. I have only duties.” (The English translation can be found at the link.) At the same time he speaks lucidly about alluding to images from other films and media as a kind of literary homage or sampling that expands art rather than diminishes it. The story of Godard, Climent and recent challenges by the French government to repeat downloading violators is conveyed in my latest The Intangible Investor column, Agent Provocateur, out in about a week. 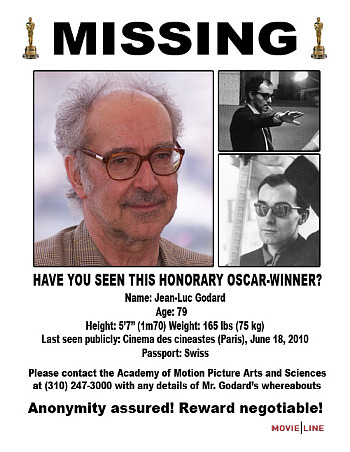 Godard failed to show to receive an honorary Oscar for Life Achievement from the Motion Picture Academy of Arts & Sciences on November 13. (See mock poster above.) His latest feature, Film Socialisme, has been shown at the Cannes and New York film festivals but he has yet to picked up for U.S. theatrical release. The wry director has not suggested the Internet as a distribution alternative.